Clean room processing is critical for the delivery of safe and effective components as the demand for parts assembled in a Cleanroom System. Since our commencement, we are immersed in presenting an elite array of Cleanroom Cabinet. We are engaged in offering Clean Room Garment Cabinets. Our range is known for its highly premium quality. These cabinets are used to store sterile clean room garments, which are used in the controlled environments. The product designed by us offers flexibility of choosing design. 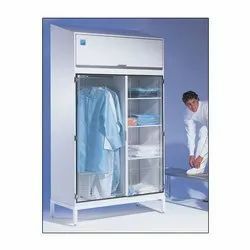 Clean room Cabinet : Clean room garments can accumulate contamination during storage and between laundry washes, which in turn may lead to lower product yields and increased product quality issues. garment storage cabinets make a positive contribution to maintaining the cleanliness of a clean room environment. Backed by the team of skilled professionals, we are offering a quality range of SS Clean Room Cabinet. We are engaged in offering Clean Room Cabinets. Our range is known for its highly premium quality. Logos Clean room Equipments Garment Sterile Storage Cabinets is a specially designed cabinet which provides a sterile filtered, clean air through HEPA filters. This cabinet protects dust and other impurities on clean room garments and other materials. 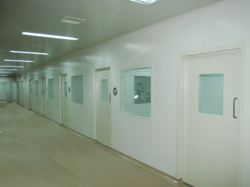 Clients can avail from us a wide range of Clean Room Storage Cabinet. These are manufactured from unmatched quality cement and other allied material and using best available techniques. Demands of these products are increasing day by day owing to its high strength, fine finish. PFN Metro Cold Storage Pvt. Ltd.